Twenty years ago, when I worked with a much smaller Medair, there were strong core values that guided our work and our relationships. During my recent field visits to projects in the Middle East, I was reminded of those same principles and saw how they are still woven through our relationships, our projects, and our culture. Just outside of Mosul, Iraq, I spent time with our national and international staff, and had the opportunity to meet people being helped by the team here. 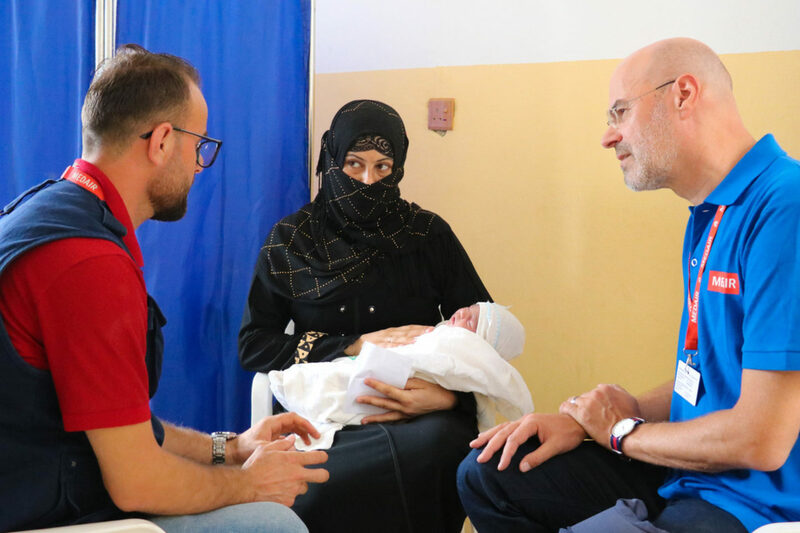 I met Israa, a young mother who brought her five-day-old son to Medair’s health clinic. For nearly four years, Israa and her family lived in an area controlled by armed groups known for using violence. Several times she has had to flee her home in search of safety. Her family of five reminded me of my own and I was touched to hear her say that Medair has made a difference in her life. In a small village north of Mosul, we visited a family struggling to survive in just two small rooms. I saw how the installation of a latrine and shower, along with a large water storage tank, preserved their dignity as well as impacted their health. Without sanitation facilities, the group of 12 had resorted to using open fields. Without protected water storage, there was a risk of contamination of drinking and cooking water. In this same community, I met Hamoudi, a volunteer who lived in the occupied area and witnessed the influx of more than 12,000 people as they fled fighting within Mosul. Hamoudi has been helping Medair for more than a year, connecting us with families in need and with community leaders who provide permission for us to work here. Hamoudi told me that he is proud to work on behalf of Medair because our team fulfills their promises. He sees work being done with integrity and he has confidence that help is reaching the people who need it the most. Children in this school outside of Mosul can stay healthier and focus on learning since Medair expanded the sanitation facilities. Hearing the laughter and learning of hundreds of children at a school where we worked to rehabilitate water and sanitation made me think of how we value hope. For 2,000 children, having just six toilets meant that students were often waiting in line during class time. With Medair’s help and the installation of latrines and handwashing stations, teachers notice that students stay in class and can focus on learning. Medair has changed and grown tremendously since I was last with this organisation, but these core values and the commitment to delivering high-quality humanitarian aid remain constant. I find myself deeply proud of the team and excited for the future.